There are many opinions on when an addict or alcoholic should commence work with other addicts. Some say you can give away what you don’t have! Often when sobriety chips are being handed out, you will hear it being suggested that you have nine months to one year before working with others. Some detox or withdrawal management centers require an addict have two years clean time before they can come in and talk to the patients. Some groups will not let you speak until you are year or more sober. We are sure you have heard other opinions and suggested guidelines. But what was the experience of the original founders of the 12 step program? This means that the addict who has taken the Twelve Steps and who has had a spiritual awakening or spiritual experience or an entire psychic change and is recovered from their addiction is qualified to work with others. How long should this spiritual awakening take? 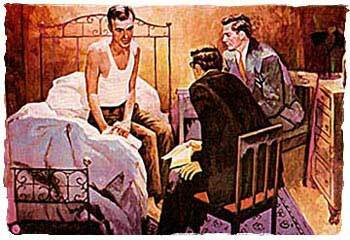 Dr. Bob (sobered June 10, 1935) was less than a month sober when he and Bill Wilson approached Bill Dotson (June 26, 1935) the third man to recover in the original group of 100 men and women of Alcoholics Anonymous. Bill Wilson started working almost immediately upon finishing his third and final treatment in December 1934. He had many failures but remained sober himself. He met Dr. Bob, his first success, in June of 1935. The Beginner’s Meetings of the early 1940s would take a newcomer through all 12 steps in four, one hour sessions over the course of one month. Then newly indoctrinated sober alcoholic would start working with the next group of newcomers in the following month! What are your thoughts about working with others? When did you start working with other addicts? How soon do you think one should start working with others? Let us know what has been your experience? When I work with a newcomer who is willing, honest and open-minded; who is willing to do whatever it takes to remain sober or clean, I will take them through all 12 steps in an afternoon to a few days. It takes approximately 3 to 5 hours to make an intelligent presentation of the 12 steps to a newcomer so they can decide for themselves if they are willing to commit to this simple program without any reservations. Some of the newcomers I have worked with, have immediately gone out to find another newcomer and commenced to show them how it works. Those who have been doing so on a regular basis are still sober and clean. Other newcomers I have worked with may require more time together so we read the first 103 pages of the Big Book, talking about our experiences, highlighting various passages, and making notes in our book (sometimes referred to as "mucking the book"). This may take, depending on how many times a week we sit down together, a month or more. Then, myself and the new initiate go out and find a suffering addict and together we work with that individual. This approach works very well also. Nowhere in the Big Book does it say get a sponsor. It says to work with other alcoholics (addicts). It works when all other activities fail! I started working with a others at 4-months sober. I was on step 4, and took her through while I went through the steps. She actually has more time then I do. And I’m coming up on 9-months sober and she is coming up on a year. I had a sponsor that said you know how to stay sober, so if someone asks you say yes. And it worked!! I just shared this in a meeting where you have the "take your time" people and felt good for sharing my truth and standing on my own 2 feet with God and not afraid of their opinions. God showed up and took me through this experience and I’m so glad I just did it. Hearing the facts about our co-founders going through steps fast is such an important piece of information that is overlooked or ignored, and I am going to do my part to show newcomers the truth. It took me changing sponsors a few times to get someone that could carry me through them fast. Thank God for Bill and Dr. Bob and Ebby and all of y’all. I’m so grateful for this program, it saved my life. Bye my friends.